Human milk contains more than one hundred oligosaccharides in addition to lactose. The structures of fourteen of them were elucidated until 1965. By combination of gel-filtration and paper chromatography, Kobata et al. successfully fingerprinted these human milk oligosaccharides (HMO) by using a small amount of milk sample. 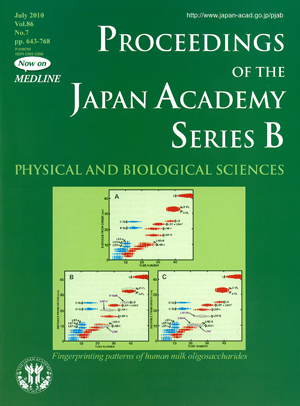 Details of the analytical method and abbreviated names of each oligosaccharide spots are described in the review written by Kobata in this issue (pages 731-747). Occurrence of three different oligosaccharide patterns was revealed by the analysis of milk samples obtained from many individuals. Pattern “A” contains all fourteen oligosaccharides, while patterns “B” and “C” lack four and three oligosaccharides, shown by dotted line spots, respectively. Important evidence was that all mothers giving pattern “B” were non-secretors and those giving pattern “C” were Lewis-negative. The four missing oligosaccharides of non-secretor contain the Fucα1-2Gal group, and the three missing oligosaccharides contain the Fucα1-4GlcNAc group. These findings indicated that the secretory organs of non-secretor individuals lack the fucosyltransferase responsible for formation of the Fucα1-2Gal group, and those of Lewis-negative individuals lack another fucosyltransferase responsible for formation of the Fucα1-4GlcNAc group. Based on this evidence, the whole biosynthetic pathway of ABO and Lewis blood group antigens was elucidated. This study revealed that HMO are formed by the concerted action of a series of glycosyltransferases responsible for formation of the sugar chains of glycoconjugates, and HMO are now expected to be useful for elucidating the structures and functions of the sugar chains of glycoconjugates. Such novel aspects of HMO research are also introduced in the review article.